Dr. Collins is currently a third-year Radiology Resident at the University of California-San Francisco, San Francisco, CA. He received his medical degree from The Northwestern University Feinberg School of Medicine in Chicago, IL, and completed his Internship at The Queen's Medical Center, Honolulu, HI. He plans to pursue a Cardiovascular Imaging Fellowship followed by an Interventional Radiology Fellowship. Noninvasive, accurate morphologic imaging of the coronary arteries is the Holy Grail of emergency medicine, cardiology, and radiology. 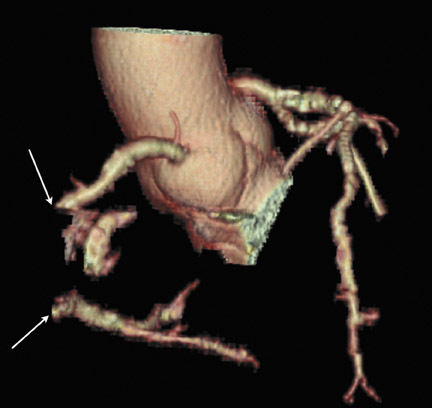 The coronary arteries are small vessels requiring submillimeter isotropic resolution to resolve distal branches. High temporal resolution is a priori to freeze cardiac motion. Dose-reducing algorithms and low-dose protocols have reduced the coronary CT angiography (CTA) dose to one that is comparable to that of catheter angiography. This article will discuss coronary CTA technique, components of image quality, radiation dosimetry, and exposure. Several aspects of coronary CTA technique are pertinent to this discussion of image quality and radiation dose. Retrospectively gated acquisitions record the ECG simultaneously with CT scanning. Imaging data are acquired throughout the entire cardiac cycle (Figure 1B). Volume data can be reconstructed at any point in systole or diastole. 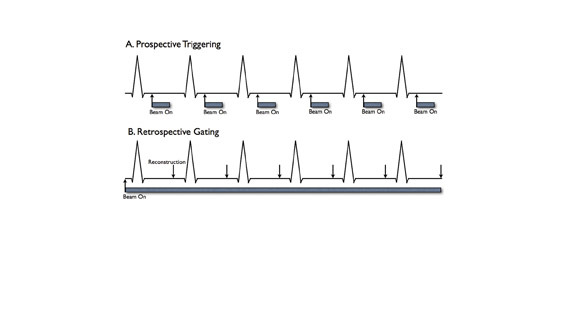 An advantage of this technique is the ability to edit the ECG tracing to exclude data acquired following ectopic beats. Cardiac functional parameters such as ejection fraction, wall motion, and myocardial thickening can also be assessed. 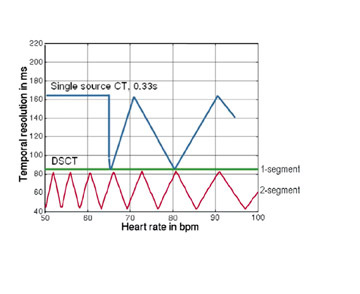 Multisegmentation refers to acquiring cardiac cycle data at a point along the Z-axis from ≥2 adjacent heartbeats (Figure 2). Although an effective solution to limited temporal resolution, this technique is particularly susceptible to beat-to-beat variability and ectopic beats. Pitch is necessarily reduced, increasing scan time and radiation dose. The SNR is a practical measure of image quality associated with spatial resolution. Reducing the reconstructed field of view or utilizing thinner collimation while keeping kVp and mAs constant results in fewer X-rays traversing each voxel relative to a constant noise background. Consequently, SNR decreases, and the image appears grainy. 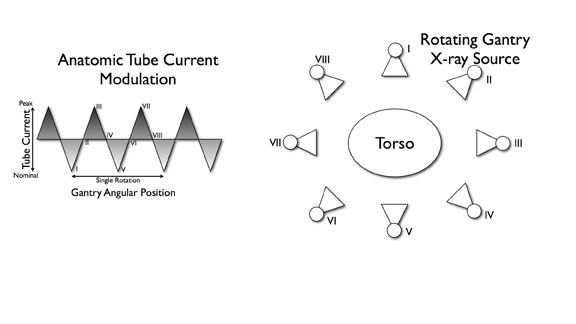 The tube current must be increased in order to maintain an acceptable SNR. Similarly, tube current must be in-creased to maintain an adequate SNR with smaller detector elements. Gains in SNR are not directly proportional to tube current, however. 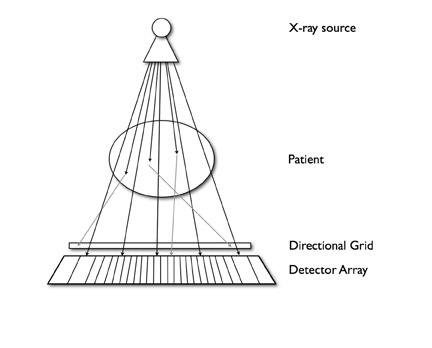 A portion of X-rays scattered within the patient are deflected out of a straight path and are absorbed by peripheral detector elements, thus increasing noise (Figure 4). Doubling the tube current results in an increase in SNR of 1.41. 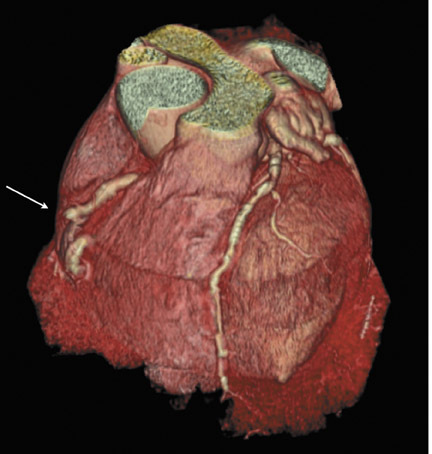 These considerations have practical implications regarding imaging the coronary arteries. Most investigators administer vasodilator medications to increase vessel size. 27 Current scanner spatial resolution is adequate for the evaluation of the epicardial coronary arteries and major branches. 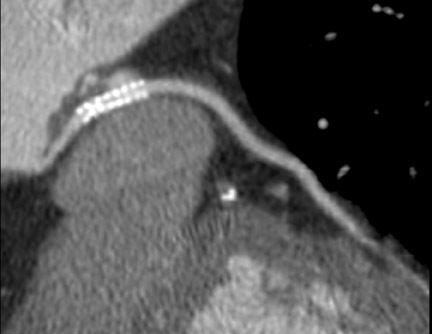 High spatial resolution reduces beam-hardening artifacts from stents and calcified vessels and improves accurate assessment of stenoses (Figure 5). 28 Techniques to reduce beam-hardening artifacts are currently under investigation (Sven Prevrhal, University of California, San Francisco, CA, personal communication). Further improvement in spatial resolution to 0.2 to 0.25 mm is necessary for accurate imaging of in-stent restenosis and plaque characterization. Future gains in spatial resolution can be achieved with smaller detector elements. Flat-panel detectors have a high spatial resolution of up to 0.1 mm. A prototype CT scanner utilizing flat-panel detectors has been developed. 29 This scanner is capable of a spatial resolution of 0.25 mm. 3 Although this is an exciting development, to achieve acceptable radiation doses and temporal resolution, further improvements in flat-panel detector efficiency and flat-panel data read-out are necessary. Slice acquisition time must be less than an isovolumetric portion of the cardiac cycle to effectively freeze cardiac motion. Using partial scan algorithms, nominal slice acquisition time can be reduced to 165 msec in scanners with 330-msec gantry rotation time. At a heart rate of 72 beats per minute (bpm), this nominal acquisition time corresponds to approximately 20% of the R-R interval. 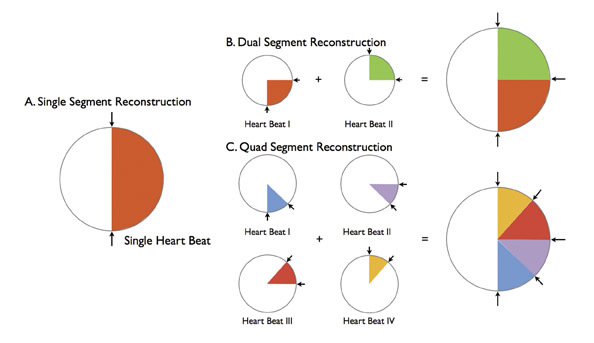 Multisegmentation reduces the effective temporal resolution by acquiring slice-specific, isophasic data from 2 to 4 consecutive heart beats. Effective temporal resolution can be reduced to 43 msec. 30,31 Improvements in temporal resolution with this technique are related to heart rate; 83 msec temporal resolution is achievable only at heart rates of 68 and 82 bpm 32 (Figure 6). These "sweet spots" occur when there is optimal desynchronization between the gantry rotation and heart rate. Effective temporal resolution with dual-segment reconstruction at other heart rates averages 124 msec. A recent study investigated the accuracy of single- versus dual-segment reconstruction at 64slice coronary CTA. 32 Although dual-segment reconstruction resulted in improved image quality, there was no difference in diagnostic accuracy. Increases in gantry rotation speeds have occurred with each generation of MDCT scanners, improving temporal resolution. Higher gantry rotation rates would generate significant centrifugal forces and necessitate increases in processing power to accommodate the high rate of data transmission. 4 The dual-source scanner design provides an efficient solution to improve temporal resolution. A temporal resolution of 83 msec is achieved with single-segment reconstruction; an average temporal resolution of 60 msec is achieved with dual-segment reconstruction (Figure 6). Several authors reported motion-free coronary CTA without pharmacologic agents using single-segment reconstruction. 4,19,20 Flohr and colleagues 4 discourage the routine use of dual-segment algorithms, citing radiation considerations. Contrast resolution refers to the ability of an imaging system to resolve 2 objects of similar size but different attenuation. This is simply demonstrated by concentric solid squares. 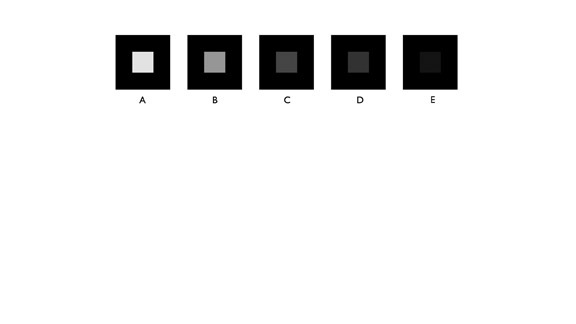 As the shading pattern of the center square closely approximates that of the outer square, they blend together and cannot be distinguished, although slight differences in shading density do exist (Figure 7). 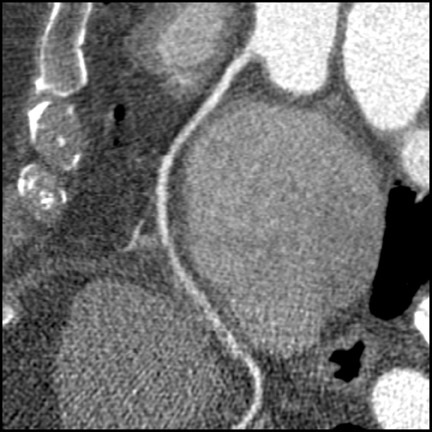 Contrast resolution is important in differentiating fatty, fibrofatty, and calcific plaque as well as calcifications from luminal contrast. 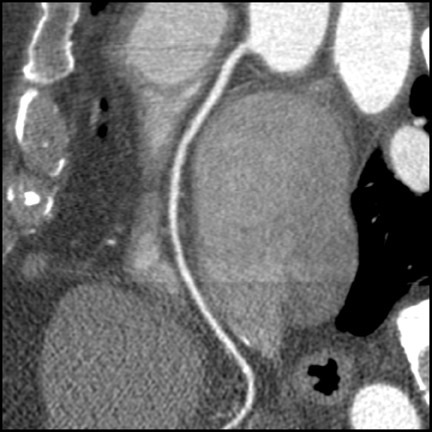 An important limitation of coronary CTA contrast resolution is the small size of luminal plaque components. 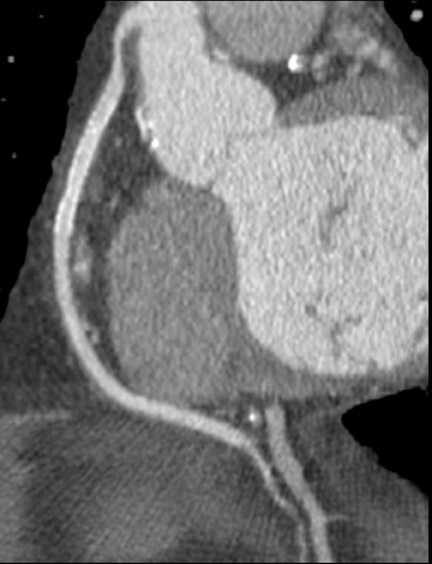 Small structures require greater differences in attenuation for differentiation at coronary CT. Ap-propriate selection of window and level settings is necessary to observe the minimum contrast during image review. Dual-source CT scanners may be able to utilize differential energy spectra subtraction to improve contrast resolution. 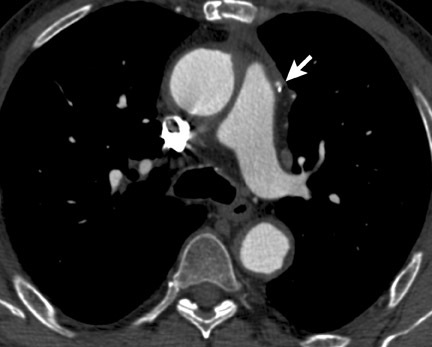 Applications at coronary CTA are the focus of ongoing investigations. All imaging studies utilizing ionizing radiation should adhere to the "as low as reasonably achievable" (ALARA) principle. Reported doses at coronary CTA vary significantly because of inconsistent application of dose-reducing methodology and varied coronary CTA protocols (Table 1). Multiple measures of radiation dose have been reported in the literature, adding to the confusion (Table 2). Radiation dose at coronary CTA is dependent on multiple technical factors. Dose is directly proportional to the square of the kVp and varies linearly with mAs. 43 All cardiac CTA protocols are acquired helically, where pitch setting determines the degree of overscanning. Pitch is defined by the length of table translation per gantry rotation divided by the total detector width. Pitch should be maximized to reduce the radiation dose. 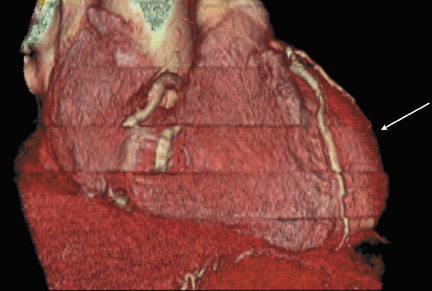 4 The scanning volume should be confined to the cardiac anatomy with the minimal necessary z-overscanning for slice interpolation at the edges of the volume. Exposure time should be minimized for all patients. It is estimated that 20% of the radiation dose is used to reconstruct a single phase. The remainder of the dose enables functional evaluation, unless additional phasic reconstructions are required for analysis. 44 Multiple strategies have been developed to reduce radiation dose. As discussed under spatial resolution above, with smaller detector elements, increased tube current is necessary to maintain SNR. Without the advent of dose-saving strategies, a significant increase in exposure would have been realized with higher slice MDCT. 39 However, a steady decline in radiation exposure has occurred from 4-slice to 64-slice MDCT because of the implementation of dose reduction strategies (Table 1). 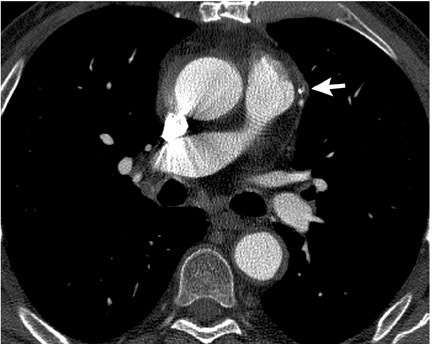 Low kVp and mAs protocols have been promulgated in smaller patients and children for coronary CTA and extracoronary CT. 52 An approach pioneered by Paul and Abada 44 measures image noise on a low-dose CT scan with 120 kVp and 20 mAs at the inferior margin of the heart. Scan parameters are subsequently adjusted based on control tables. A recent study by Hausleiter and colleagues 39 compared doses at 16- and 64-slice coronary CTA using 100 kVp and 120 kVp protocols with ECG modulation. They reported 53% and 64% dose reduction at 16- and 64-slice coronary MDCT, respectively, without a difference in evaluable coronary segments. A recent study by Delhaye et al 41 evaluated the feasibility of coronary segment analysis on 64-slice MDCT gated thoracic imaging with a low-dose protocol (120 kVp and 200 mAs). Although the study was not tailored for coronary imaging, 75% of coronary segments were evaluable. The average dose for low-dose gated thoracic evaluation was 5 mSv. The accuracy of low-dose protocols is the subject of ongoing research. The lifetime attributable risk (LAR) of cancer incidence from coronary CTA was recently analyzed by Einstein and colleagues. 73 Monte Carlo simulations and data from the National Academies' Biological Effects of Ionizing Radiation 7th report formed the basis for their work. The authors highlighted stochastic risk associated with coronary CTA in younger patients, particularly women. The LAR for a 20-year-old woman undergoing 35% ECG modulated coronary CTA was estimated at 0.46% or 1 in 219. This compared to an LAR of 0.1% or 1 in 1000 in a 20-year-old man. The LAR declined progressively with age. A 20-year-old man had 5 times the relative risk (RR) of an 80-year-old man. However, a 20-year-old woman had 23 times the RR of an 80-year-old man. Gender-specific differences in LAR were attributed to increased lung parenchyma and breast doses in women. Ionizing radiation is a relatively weak carcinogen. Differentiating ionizing-radiation-induced cancers from sporadic and other carcinogen-induced cancers is challenging, as approximately 40% of the U.S. population will develop cancer. 74 Investigators have turned to population-based data to determine the scope of medical imaging exposure. In 1980, the collective dose from medical imaging was 0.55 mSv per person. This quantity has increased approximately 6-fold to 3.3 mSv per person in 2006. 58 The U.S. population dose from medical imaging in 2006 totaled 450,000 person-Sv. This compares with 600,000 person-Sv total exposure from the Chernobyl nuclear accident. The total annual U.S. population exposure is comparable to that in high background radiation regions of China. 70 Gonzalez and colleagues 75 estimate a 0.6% to 1.8% lifetime cancer risk from radiation exposure at medical imaging in developed countries. The European Commission has developed guidelines for exposure limits for CT. 76 Currently, no federal guidelines exist for CT dosimetry. The American College of Radiology (ACR) recently published a white paper on radiation dose, 77 which makes recommendations on imaging utilization but does not specify CT dosimetry guidelines. Effective doses at coronary CTA, positron emission tomography, diagnostic angiography, and nuclear imaging are listed in Table 4. Effective doses at coronary CTA vary significantly based on imaging protocol and patient factors, but range from 4.95 to 40 mSv. 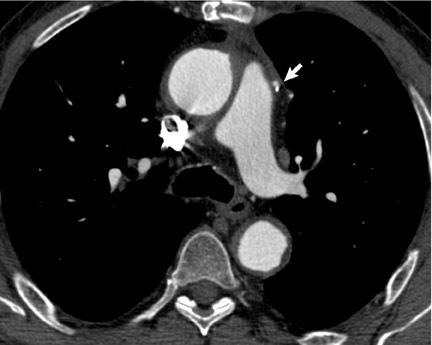 Using dose reduction techniques, radiation doses at coronary CTA are similar to diagnostic catheter angiography and technetium-99m nuclear perfusion studies. Innovations in scanner design have yielded consistent improvements in image quality since coronary CTA was first described with EBCT. Novel dose-reduction strategies realized reduced effective doses with later-generation CT scanners. Rapid, accurate, noninvasive coronary imaging is now possible at CTA with radiation doses comparable to a diagnostic catheter angiogram. Image quality and radiation dose at coronary CT angiography. Appl Radiol.